The original international English title was NERO'S BIG WEEKEND but this is a poster for a the 1962 release in the US. She wasn't a big star yet when it hit theatres back in 1956 but by 1962 Bardot was an international star and Bardot is front and center here. See dreaded slave galleys! See Bardot bathe in milk! See ROMAN ORGIES! Yes, I was going to add this would have been after BB's rise to fame ... she is quite charming in it as she is in the same mid-50s HELEN OF TROY and DOCTOR AT SEA, before Vadim made her over, and how. NERO'S BIG WEEKEND or MY SON NERO is great fun with Sordi (in TWO NIGHTS WITH CLEOPATRA mode), De Sica and Gloria Swanson who makes a stunning entrance in red. "...before Vadim made her over, and how." She almost looks like a different person after Vadim made her over. 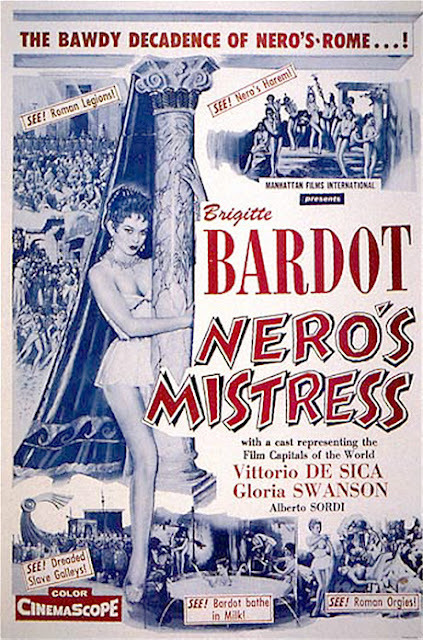 I believe Bardot is the best Poppea ever in this film. NERO'S BIG WEEKEND is a fun film...very colorful.